Grace and mercy to you from God the Father and our Savior Jesus Christ. Amen. Let us pray, Gracious Father, who sent Your Son to a wedding in Cana, bless our marriages with the ongoing presence of Jesus Christ; Your Son our Savior. Amen. I was standing behind my teacher. She kindly incorporated me into the class. She didn’t yell at me. After that I put her on a high pedestal. Or, for the purpose of this sermon, who are your favorite authorities? People you place on a pedestal. It is common to place other people on a pedestal. We keep telling fond stories about them long after we have lost contact with them. We do that in the church, too. Pastors have the tendency to quote seminary professors almost more than the Scriptures. People have a tendency to quote and look up to Sunday School teachers or former pastors trusting them more than the Holy Scriptures. Today, we heard of Jesus’ first miracle. Jesus changed water into wine which only God can do. It is not only ok to put God on a pedestal, but according to the First Commandment, we learn it is required to place God on a pedestal so that we do not fear, love, or trust anyone above God. The same goes for God’s Word. Especially as it is recorded in His Holy Bible. People have a way of putting human authorities on high pedestals, be it people or the books they write or the films they make. The buck stop with them. Unfortunately, that often means a high school teacher, college instructor, or seminary professor, because students are easier to influence at that age. Since we cannot count on human authorities, who often err, we should only treat the Word as the final authority on all matters. Therefore, if we have something from Jesus on any given matter, that settles the question. Disputes arise. What should be done? Study the Holy Scriptures to settle the question. All doctrinal matters are already settled by the Scriptures, but they are often not confessed and taught by man. Church authorities might say, “The matter is settled” but no person can settle a matter on their own authority or influence alone. The dispute will fester. Thus we have the Word of God as the authority that never varies, never contradicts itself. I tried listening to a Ben Shapiro podcast recently. He is a fast talker. I couldn’t keep up. Then I realized I had set the audio to 1.5X the normal speed so he was talking even faster than normal. That’s why I couldn’t keep up with all the details. So I listened again from the beginning. Likewise, the Gospel has so many important details that we need to stop and look at passages, phrase by phrase. 2 And both Jesus and His disciples were called to the marriage. By attending the marriage, Jesus blessed the married state. He did not come alone, by stealth, as some people do with gatherings that are not approved, but brought along His disciples who were all witnesses to this event and the first of His miracles. 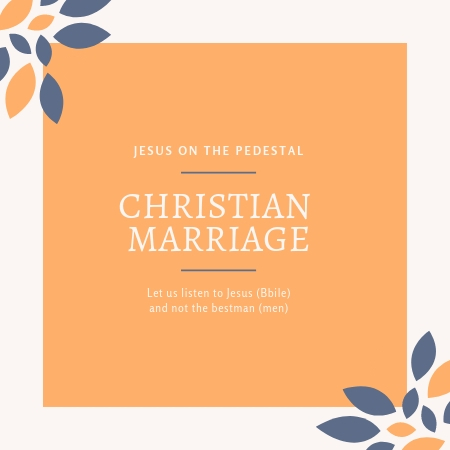 Every Christian couple should place Jesus on the pedestal of their marriage. Jesus blesses marriage even yours as He keeps His promise to both of you. 3 And when they wanted wine, the mother of Jesus said to him, They have no wine. 4 Jesus said to her, Woman, what have I to do with you? My hour is not yet come. 5 His mother said to the servants, Whatever he say to you, do it. 6 And there were set there six waterpots of stone, after the manner of the purifying of the Jews, containing two or three firkins apiece. 7 Jesus said to them, Fill the waterpots with water. And they filled them up to the brim. 8 And he said to them, Draw out now, and bring it to the governor of the feast. And they brought it. In this first of all His miracles, Jesus made it impossible to refute what happened. Really smart people offer various explanations for other miracles - rather absurd, because they assume details never given - such as lunches hidden away for the Feeding of the Multitude. Like that miracle, this miracle also demands faith in the power and efficacy of God's Word, which is lacking today. Many "conservative" Lutheran leaders say they believe in the sacraments, but they deny that God created heaven and earth in six-24 hour days. But these fine men worry about their reputations in the academy/universities. Again, Jesus’ Holy Bible is not put on the pedestal. And though the Scriptures and Book of Concord clearly say we are declared forgiven through faith in our Savior, their are conservative Lutheran Leaders who deny this for more logical explanations. I find some humor in the steward of the feast becoming alarmed at the quality of the wine and scolded the bridegroom. This is a feature of John's Gospel - someone misunderstanding what has just happened, which helps us see how great a gap exists between faith in Christ and one's natural (but blind) understanding. It is not by accident that the bridegroom is the object of the rebuke. In the New Testament, Jesus is the Bridegroom, and the Church is the bride. So, as Luther says, this is not only a very special miracle showing the power and efficacy of the Word, but also a parable about bearing the cross and about marriage. As he says so wisely, we are used to providing the best wine first and the not-so-good later. That is what the steward expected. How dare the bridegroom save the best for last! Americans have made a disaster of marriage because everyone is listening to the steward rather than to the Word. As Luther said, many disagreeable things are associated with marriage and raising children. The difficulties seem overwhelming at first, and they often continue for years. Jesus’ disciples believe on Jesus. Let us keep Jesus on the pedestal and in time your marriage problems will not seem overwhelming. Hear Jesus. Forgive your spouse. God bless you now and always; in the name of the Father and of the Son and of the Holy Spirit. Amen. The peace of God, which passes all understanding, …..
2:1-11. — By the power of his personality and by his divine knowledge and words Jesus had attested himself as truly being the Messiah of whom the Baptist had testified, as the Son of God and the Son of man. To the attestation through the word is now added that of the deed, which was made evident in the first miracle. This wedding must be thought of in the Jewish fashion. In the betrothal bride and groom were pledged to each other in a way that truly made them man and wife, although the two did not at once live together following this ceremony. An interval, longer or shorter, followed, and then the gamos (wedding) took place. The groom with his companions brought the bride with her companions to the groom's home, and there without any further pledge the celebration began, starting toward evening with a feast as grand as possible and continuing for a week, the couple now living together. 2. In the first place, it is indeed a high honor paid to married life for Christ himself to attend this marriage, together with his mother and his disciples. Moreover, his mother is present as the one arranging the wedding, the parties married being apparently her poor relatives or neighbors, and she being compelled to act as the bride’s mother; so of course, it was nothing more than a wedding, and in no way a display. For Christ lived up to his doctrine, not going to the rich, but to the poor; or, if he does go to the great and rich, he is sure to rebuke and reprove, coming away with disfavor, earning small thanks at their hands, with no thought of honoring them by a miracle as he does here. "22. In the third place, we must briefly touch upon the spiritual significance of the text. This marriage and every marriage signifies Christ, the true bridegroom, and Christendom, the bride; as the Gospel lesson of Matthew 22:1-14 sufficiently shows."